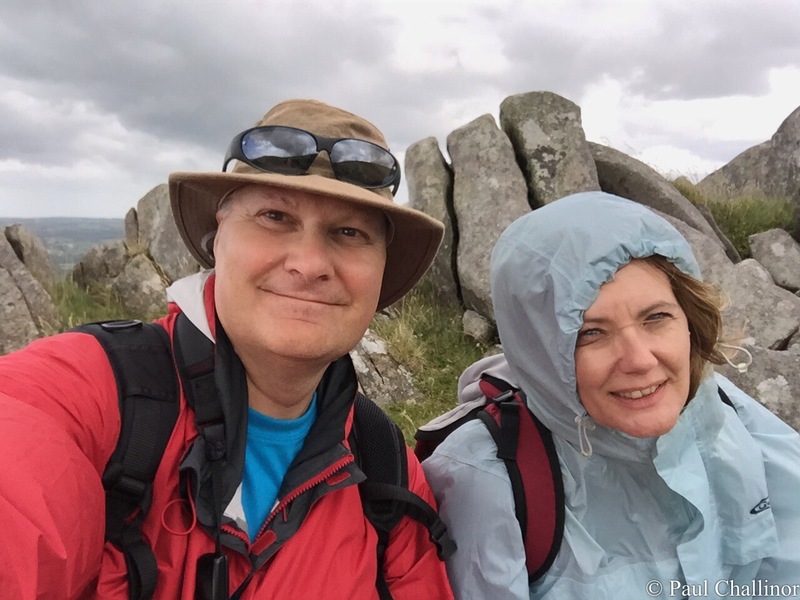 A few weeks ago Aunty and I were careering around West Wales adding to our list of 100 things to do in Wales and our last expedition of the week was a short walk up into the Preselli Hills. These hills are. It especially high, or difficult to climb, but they do have a mythical past and may have been important to the people who,lived here during the Neolithic period. Evidence of this is still present in the number of cromlech scattered around the area, and especially Pentre Ifan. However, it is thought there is more to these hills. The stone outcrops visible throughout the area are thought to be the origin of the Bluestones used in Stonehenge. Now Stonehenge is nowhere near the Preselli hills. It’s about 180 miles away in fact. The second and most dramatic stage of Stonehenge started around 2150 BC when about 82 bluestones were used in its construction. It been acknowledged for some time that the likely source of the bluestones is the Preseli mountains. Recent advances in geological,sciences have been able to pinpoint the origin of some of the stones specifically to Carn Goedog. 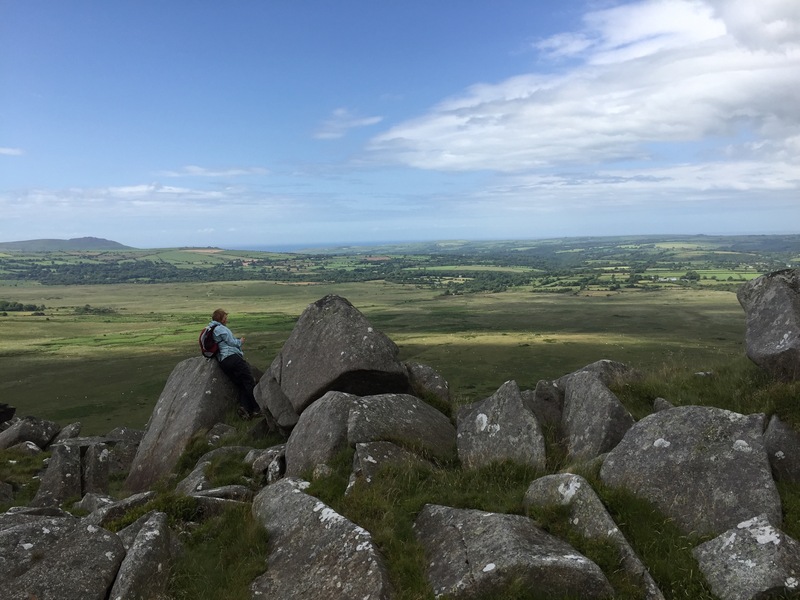 A paper published by Bevans and Pearce provide evidence based on compatible element geochemistry and Principal Component Analysis’ which has recently been published in the Journal of Archaeological Science suggests that although there are at least two geographical sources in the Preseli Hills and perhaps more, Carn Goedog is the source of the numerically largest group of dolerite orthostats. 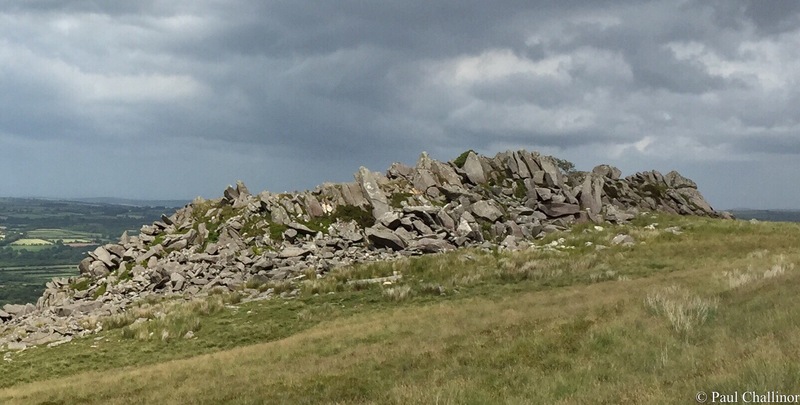 Carn Menyn, for a long time the favourite site for the spotted dolerite bluestone quarry, was found not to be a match for any of the Stonehenge bluestones. So how did the stones get from here to there? There are two main theories. 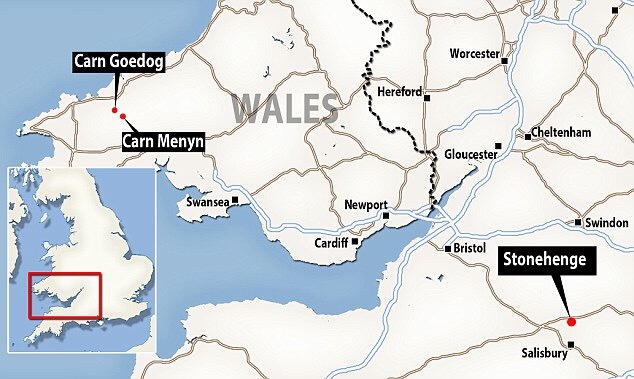 One proposed and supported by Brian John and discussed in a series of lectures proposes that the stones were carried from West Wales towards the Stonehenge area via a Glacier that flowed eastwards up the Severn Estuary. When the glaciers melted the stones were left in situ. The bluestones were then collected from around the area and used in the earlier stages of Stonehenge. The more mundane theory of carriage of the stones by glacier is feasible, but I preference the heroic version that has these stones, some weighing 4 tonnes each, dragged on rollers and sledges to the headwaters on Milford Haven and then loaded onto rafts. From here they were carried by water along the south coast of Wales and up the rivers Avon and Frome, before being dragged overland again to near Warminster in Wiltshire. The final stage of the journey was mainly by water, down the river Wylye to Salisbury, then the Salisbury Avon to west Amesbury. This astonishing journey covers nearly 240 miles. Once at the site, these stones were set up in the centre to form an incomplete double circle. But a reconstruction recently showed exactly how difficult this would have been with the technology available during the Neolithic period. I supposed you make your own choice on how they really were transported. Either by by nature or man. Which ever way it happened, the remoteness of the hills is striking, along with the views over the sorrounding valleys. As ever in The Welsh hills the weather can change. One minute the sun was shining and the next the wind came up and it rained hard, only for the sun to come out again five minutes later. Fascinating research and wonderful scenery. Thanks Andrew. I’m never sure how much to put in on these blogs. Aunty keeps on telling not to bore people. But I say why stop something I’m good at! Don’t listen to her, Paul. Keep up the good work. Next Next post: … and all manner of things.